Approx. length: 58"L down center front, 59.5"L down center back. 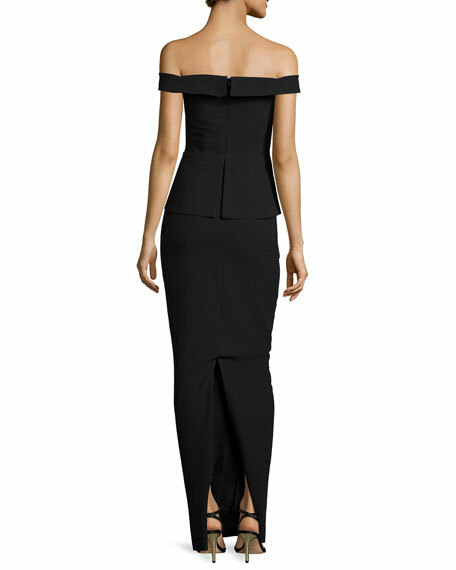 Balmain gown in ruched stretch crepe, featuring embellished mesh insets. Crew neckline; sweetheart illusion. Long semisheer sleeves; padded shoulders. Gathered at left waist. Bodycon silhouette. Knee-high slit. Floor length. Back zip. Viscose. Made in France. Chiara Boni La Petite Robe "Dulcinea" peplum gown with pearly beads. High-bateau neckline. Three-quarter sleeves. Body-conscious silhouette. Raw-edge hem for ease of tailoring. Pearly beading details trim. Peplum waistline. Floor-length hem. Step-in style. Nylon/spandex. Made in Italy. 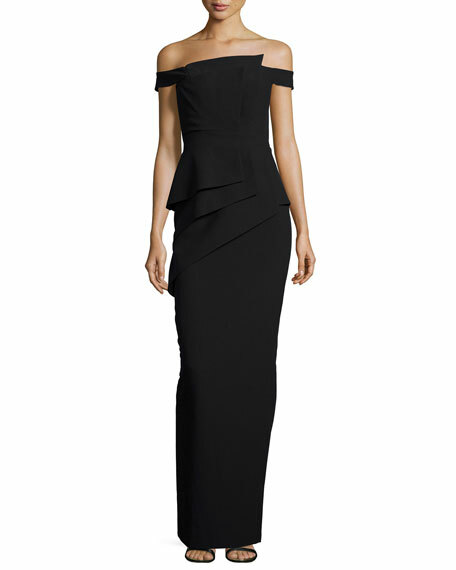 Chiara Boni La Petite Robe "Marine" gown with asymmetric satin ruffle. Asymmetric one-shoulder neckline. Sleeveless at left; right cap sleeve.